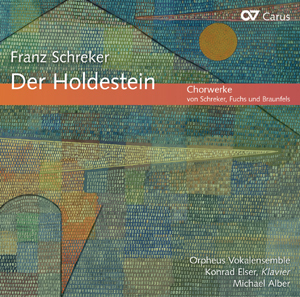 Franz Schreker had a long and close association with choral music. As founder and director of Vienna’s Philharmonic Chorus he conducted world premieres of works by contemporary composers. It is surprising, therefore, that Schreker wrote relatively few independent choral works. Most of these are recorded here for the first time: The Orpheus Vokalensemble, under Michael Alber, makes an essential contribution to this largely unknown side of Schreker with this survey of his choral music. The recording is rounded off with choral works by Schreker's teacher Robert Fuchs, his contemporary Walter Braunfels and choral arrangements of three Schreker songs by Clytus Gottwald.